The Ural River rises in the Ural Mountains in Russia and flows for half its length through Russian territory until it crosses the border into Kazakhstan, finally emptying into the Caspian Sea. It is the third-longest river in Europe, after the Volga and Danube. The Ural is often cited as defining a long stretch of the border between Europe and Asia, although the exact position of that border is open to debate. The Caspian Sea is a landlocked body of water lying between Asia and Europe. By some definitions, the Caspian is the largest lake on the planet. The name “Caspian” comes from the Caspi people who lived to the southwest of the sea in South Caucasus. The word “delicatessen” (or “deli” for short) came into English from the German “Delikatessen”. The Germans borrowed the word from French, in which language “délicatesse” means “delicious things (to eat)”. The term’s ultimate root is “delicatus”, the Latin for “giving pleasure, delightful”. “Soli” (the plural of “solo”) are pieces of music performed by one artist, whereas “tutti” are pieces performed by all of the artists. The phrase “swan song” is used for a final gesture, a last performance. The expression derives from an ancient belief that swans are silent for most of their lives, but sing a beautiful song just before they die. “Steppenwolf” is a 1927 novel by German-Swiss author Hermann House. The title translates from German as “Steppe Wolf”, referring to a wolf found primarily in the steppes of Europe and Asia. “Much Ado About Nothing” is a play by William Shakespeare, and a favorite of mine. It is a comedic tale of two pairs of lovers with lots of mistaken identities and double meanings. I once saw it performed in the fabulous Globe Theatre in London … by an all-female cast. Such a performance was somewhat ironic, given that in Shakespeare’s day the practice was to use an all-male cast. There are conflicting stories about the origin of the Reuben sandwich. One such story is that it was invented around 1914 by Arnold Reuben, an immigrant from Germany who owned Reuben’s Deli in New York. The word “booby” has described a silly person since the late 1500s, with the term coming from the Spanish “bobo” meaning “stupid person. By the mid 1800s, schoolboys were pranking each other by setting “booby traps”. The latter innocent term took on a lethal meaning during WWI when it described a device designed to kill someone who triggered it unwittingly. Boobies are seabirds. There is a suggestion that the name “booby” comes from the Spanish slang “bobo” meaning “stupid”. Boobies were said to be stupid as they were known to land on sailing ships and were easily captured and eaten. The origins of the phrase “duck soup”, meaning anything easily done, aren’t very clear. However, the expression does at least date back to 1908. Yogi Bear made his debut for Hanna-Barbera in 1958, on “The Huckleberry Hound Show” before he was given his own series. Do you remember that collar that Yogi wore around his neck? That was a little trick from the animators. By using the collar, for many frames all they had to do was redraw everything from the collar up, saving them lots and lots of time. Yogi and Boo Boo lived in Jellystone Park, and made Ranger Smith’s life a misery. The ballpoint pen was invented by László Bíró in the late thirties, a Hungarian newspaper editor. Over in Ireland we use the term “biro” as a generic word for “ballpoint pen”. American singer-songwriter Jackson Browne was actually born in Heidelberg, Germany. Browne’s father was stationed there with the US Army. “Doctor My Eyes” is a 1972 song written by Jackson Browne that appeared on his debut album titled “Jackson Browne”. Backing vocals were provided by David Crosby and Graham Nash of the Crosby, Stills and Nash. The fennec fox is a small fox found in the deserts of North Africa and the Middle East. It is a crepuscular animal, meaning that it is active around dawn and dusk. The name “fennec” comes from the Berber word “fanak” meaning “fox”. It is the national animal of Algeria, and in the Algerian national soccer team are nicknamed “Les Fennecs”. The yin and the yang can be illustrated using many different metaphors. In one, as the sun shines on a mountain, the side in the shade is the yin and the side in the light is the yang. The yin is also regarded as the feminine side, and the yang the masculine. The yin can also be associated with the moon, while the yang is associated with the sun. Terns are a family of seabirds. They are similar to gulls, but are more slender and more lightly built. Many species of tern are known for their long-distance migrations, with the Arctic tern migrating so far that it is believed to see more daylight in a year than any other animal. Saxony was the name given at different times in history to states along the Elbe river in central Europe. As the various states broke up, they spawned many duchies that retained the name “Saxe”. The most famous of these duchies was probably Saxe-Coburg and Gotha, two united duchies in Germany that ceased to exist after WWII. A notable branch of the Saxe-Coburg and Gotha House is the British Royal Family, as Queen Victoria was married to Prince Albert of Saxe-Coburg and Gotha. King George V of the United Kingdom changed the name of the family to the House of Windsor in a politically sensible move during WWI. A hawser is a thick cable or rope that is used for mooring or towing a ship. The term “hawser” comes from he Old French word “haucier” meaning “hoister”. I must admit that I don’t really know much about Rastafarianism. I do know that a “Rasta”, such as Bob Marley, is a follower of the movement. Some say that Rastafarianism is a religion, some not. I also know that it involves the worship of Emperor Haile Selassie I of Ethiopia. The use of the phrase “goose egg” to mean “zero” is baseball slang that dates back to the 1860s. The etymology is as expected: the numeral zero and a goose egg are both large and round. Nemesis was a Greek goddess, the goddess of retribution. Her role was to make pay those individuals who were either haughty or arrogant. In modern parlance, one’s nemesis (plural “nemeses”) is one’s sworn enemy, often someone who is the exact opposite in character but someone who still shares some important characteristics. A nemesis is often someone one cannot seem to beat in competition. “Enure” is a variant spelling of “inure”, which means “to harden oneself against the effects of, to accustom oneself to”. The asphalt surface on roads (or basketball courts) is more properly called asphaltic concrete, because asphalt itself (also known as “bitumen”) is just a sticky black liquid that comes from crude petroleum. Asphalt is used as a binder with aggregate to form asphaltic concrete. The Mojave Desert in the southwest is named after the Native American Mohave tribe. Famous locations within the boundaries of the desert, are Death Valley, Las Vegas, Nevada and the ghost town of Calico, California. A jack-knife is a pocket knife with a folding blade. The term “jack-knife” goes back at least to the early 1700s, and might possibly have referred to a knife used by sailors (i.e. jack tars). The use of “jack-knife” to describe a folding swimming dive dates back to 1922. LAT: 5:14, no errors. WSJ: 5:56, no errors. Newsday: 6:50, no errors. Jones: 12:07, 1 error (Natick 47A-44D). 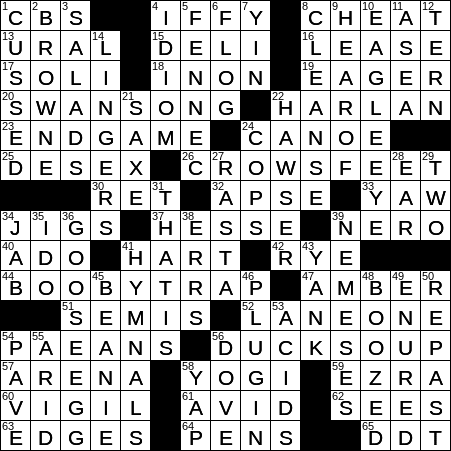 Another example of a constructing feat (the use of 72 E’s) that made the puzzle terrible to solve by the fill required to pull it off. Yesterday’s BEQ: 46:08, 2 errors on random guesses. Harder than the New Yorker, I thought. A general thought: If Dave stops posting his other puzzles when he gets back, I will probably follow suit, simply because I started because he did. That said, hopefully there was something useful for others, at the very least awareness of everything that’s out there. Please don’t curb your conversations. I enjoy reading it all. Can you tell me the meaning of 4D? Answer idiom. Thanks. “strong suit” and “weak sauce” are examples of idioms. 0 errors on Monday’s puzzle; found it harder than Tuesday. but I really enjoy reading them and seeing why you guys are so good. This wasn’t easy either. Think “they” are messing with us this week for some reason. I did finish but the upper midwest was a struggle. Hawser, fennec, and the phrase “duck soup” were new to me. Dave, thanks for explaining the South Bend reference from yesterday, I was curious. Had to Google for FENNEC. The words around it were obtuse until I looked it up. There were others that I didn’t know but got by crosses: YAW, HAWSER, RUPERT. As far as IDIOM, never heard of “weak soup.” After, I couldn’t find any information on it. The only foreign country I’ve visited is Canada. Happily, my husband and son have been to many. My son speaks French and spent a month there. He told me he prefers Chartres to Notre Dame. I prefer the Sagrada Familia in Barcelona. My husband speaks Italian and prefers visiting people than viewing art. One day, at the Metropolitan Museum in NYS, I went into the El Greco room and sat down on a bench. 3 hours later, I came to my senses. Later I was told this is called the Florentine effect, a sort of trance. 14:33. Agree that yesterday and today are harder than normal early week puzzles, but that’s a good thing. I got stuck for the longest time in the upper central. I couldn’t think of IFFY at first, didn’t know FENNEC, wasn’t thinking of IDIOM (I was actually thinking of a weak sauce…). I finally got it but spent an inordinate amount of time on that tiny area.